TCP/IP stands for Transmission Control Protocol / Internet Protocol. The TCP/IP model consists of 4 layers and is the model that the Internet is based on. Each layer of the model has a specific job to do in order for communication to take place over the network. The four layers in order from top to bottom are: Application, Transport, Internet and Network Access (also known as link). 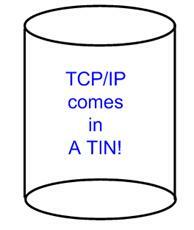 One common way of remembering the layers of the TCP/IP model and their order is by using a sentence that includes a mnemonic: TCP/IP comes in A TIN.